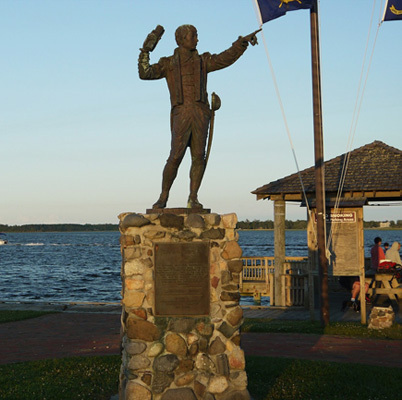 The approximately 12-foot-tall statue is located in Bicentennial Park, which is on Swansboro’s waterfront along the White Oak River at the base of the NC Highway 24 bridge. The life-sized figure is dressed in the military garb of a privateer in the navy. The figure is holding a rolled up document and pointing in the direction of his place of birth, approximately 2 miles away. The statue is near another monument in the same park, the Theophilus Weeks Marker. The Friends of Otway Burns contributed $18,000 toward the cost of the statue. Captain Otway Burns, Jr. was one of North Carolina’s most lauded naval heroes in the War of 1812, and later a state legislator (in both the house and senate). When the war broke out, Burns and business partners bought a ship and renamed it the Snap Dragon. The ship operated privately throughout the war, authorized by the government to attack enemy shipping. The privateer had a crew of up to 100 sailors and eight cannons. Burns commanded the ship on three wartime missions, sailing it from Newfoundland to South America. Between 1812 and 1814, the ship and its crew captured more than forty British ships and their cargoes. After the war, Burns moved to Swansboro with his profits and built the Prometheus, one of the state’s first steam-powered boats. He became a shipbuilder and, later, a state senator. He lost all of his money and was destitute until appointed by President Jackson as the Keeper of the Brant Island Shoals Light Boat near Portsmouth, N.C., where he lived out his life. He died there on October 25, 1850. Burnsville in Yancey County and Otway in Carteret County are named for Burns. See also Otway Burns Statue in Burnsville, Yancey County and his tomb at Old Burying Grounds, Ann St United Methodist Church, Beaufort, N.C. 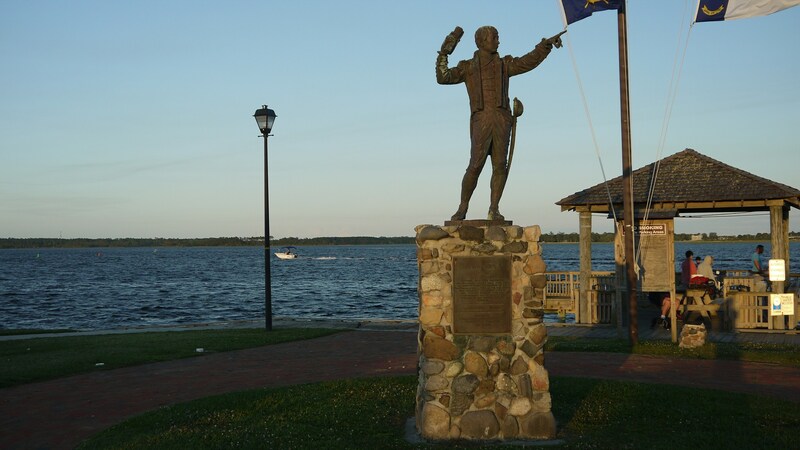 The statue is located in Bicentennial Park on the Swansboro waterfront along the White Oak River at the base of the NC Highway 24 bridge into town. The monument is in the same park as the Theophilus Weeks Marker. The statue is in the center of a small city park, set against the backdrop of the waterfront. The status is an attraction and feature of Bicentennial Park along White Oak River.